“I have strength for all things in Christ Who empowers me [I am ready for anything and equal to anything through Him Who infuses inner strength into me; I am self-sufficient in Christ's sufficiency].” (Philippians 4:13, Amplified Bible) I love this translation of this scripture – it truly ‘amplifies’ God truth for our understanding. Today so many walk around / live as if they are defeated before they ever step onto the battlefields of life. They are held prisoner – “shackled” – to their past, sitting idle in their self-made prisons of yesterday, seemingly hindered from moving forward in this journey of life. Yet this is a ‘false assessment’ planted in our hearts by the enemy – in Christ, we are truly FREE! The Apostle Paul writes, “Christ has set us FREE! This means we are really FREE. Now hold on to your freedom… (“do not be hampered and held ensnared and submit again to a yoke of slavery” Amplified Bible)”(Galatians 5:1, NLT) Listen, nobody is perfect but Christ Himself. We all make mistakes – we all fall (‘sin;’ Romans 3:23). Yet when we reach up in sincere confession to Him, our Heavenly Father reaches down with His hand of forgiveness and lifts us up, cleaning us off (1 John 1:9) and sending us back to the journey He has planned for us since the beginning of time. Listen for a moment to this list of Heroes of Faith as recorded in the Bible – Abraham, the man of faith; Moses the lawgiver; David, a man after God’s own heart; Elijah, a mighty prophet of God; Peter, the rock of Christ, and Paul, the great evangelist/church planter. As surely as these men’s testimonies are an inspiration for us today, they were all still human sinners just like each of us. Let’s take another look at that list – Abraham the liar (Genesis 12:13) and the impatient one (Genesis 16:2); Moses the murderer (Exodus 2:12); David the adulterer and murderer (2 Samuel 11); Elijah, one prone to depression, despair and suicidal thoughts (1 Kings 19:3-4); Peter, the public denier of Christ and Paul, the once persecutor of Christians (Acts 8:3). Chris Tiegreen in The One Year at HIS feet devotional writes, “What churches or ministries today would accept them for service based in their past? God did. Not only did He use them in His service, He showcases them in His Word. They are trophies of His grace (and mercy).” So what’s keeping you in the dark dungeons of your past? According to God’s Word, the only thing standing between you and true freedom in Christ is your decision to receive it! The prophet Isaiah prophetically proclaimed the power-filled words of Christ hundreds of years before the Messiah arrived on earth, “This is what the LORD says …to the prisoners (“captives ” NIV), ‘Come out in freedom,’ and to those in darkness, ‘Come into the light.’” (Isaiah 49:8-9, NLT) As Romans 1:20 declares, we stand today at the door to freedom “without excuse” for remaining in our sin-created prison cells. Never forget that you and I were created by our Creator to be FREE! So “stop decorating your prison cell…it’s NOT your home!” (“Captivity” LifeWalk message (2.21.2010), Journey 2427) Your actions today create tomorrow’s history (past) … ponder that for a moment. The time is NOW for you and I to make a PRISON BREAK from the captivity of our yesterdays … Christ awaits your step TODAY into the fullness of His divine freedom which He purchased for you and I on Calvary’s Cross over two thousand years ago … don’t just say your free, live out that freedom that only comes through our great Liberator, Jesus Christ (Romans 6:17-18, HCSB)! 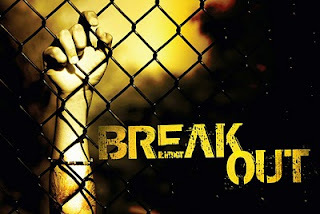 Let’s scale the walls of our prisons – true freedom awaits us along with a faith journey unlike we can even begin to imagine (Ephesians 2:20-21) …Selah! Today's Spirit-led video is by CCM artists Hillsong and can be viewed by clicking on the on the song title, "In Your Freedom" - G3 for His gift of ministry thru Christian music!